BUT I have been pretty busy getting ready for my vacation. I'm actually on vacation as we speak, so the theme of this photo shoot is "Day before vacation and need to pack realness." So these pics are not my best, but I had a lot of fun sewing up the clothes! All of the patterns are from Patterns for Pirates. 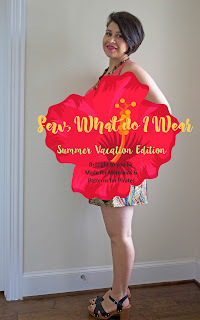 They're perfect for fast and cute summer garments...and I can't WAIT for the new swimsuit patterns to be released! Be sure to check out all the other fabulous vacation makes on this blog tour too. First up is the Essential Tank. I bought this pattern when it came out last year and who knows why it took me so long to make one? To make up for it, I promptly sewed three. 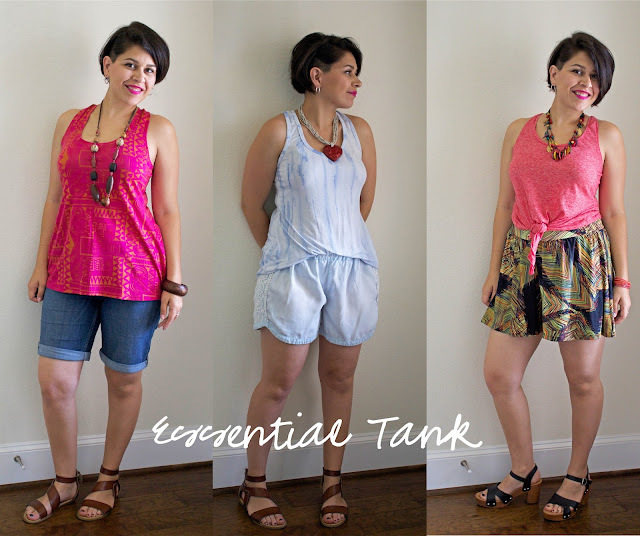 During Me Made May I was able to ID some holes in my handmade wardrobe: tanks and shorts/skirts. What I love most about this tank is the curves. I graded from a medium at the shoulders, large through bust and waist, and extra large for the hips. These are all racerbacks. The first one is paired with RTW jean shorts. The pink and tan tribal fabric is a cotton jersey from Urban Rag Trader. The blue is a floaty rayon spandex from LDG Textiles. The shorts are RTW, but you could use the Made for Mermaids Lucy pattern to recreate them! The third one is a cotton/poly jersey also from LDG Textiles. 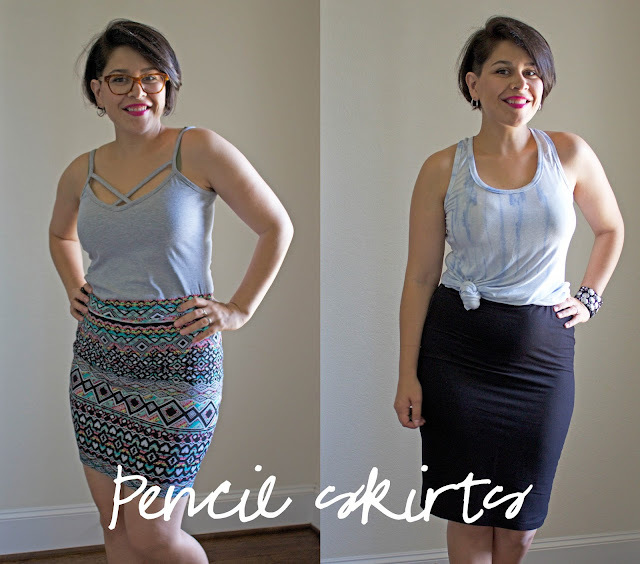 I also made some pencil skirts. The first one is paired with a Cross My Heart cami. I can't wait to make up a bunch of those after vacation! The cotton spandex for the cami is from Raspberry Creek Fabrics and the skirt is also cotton spandex from LDG. The second one is with my Essential tank and is made from a black denim-look knit from Cali Fabrics. I really love the high waist option on these skirts, although I did make the black one a little too tight. Oops! And last I wanted to share my culottes. I LOVE how these turned out! 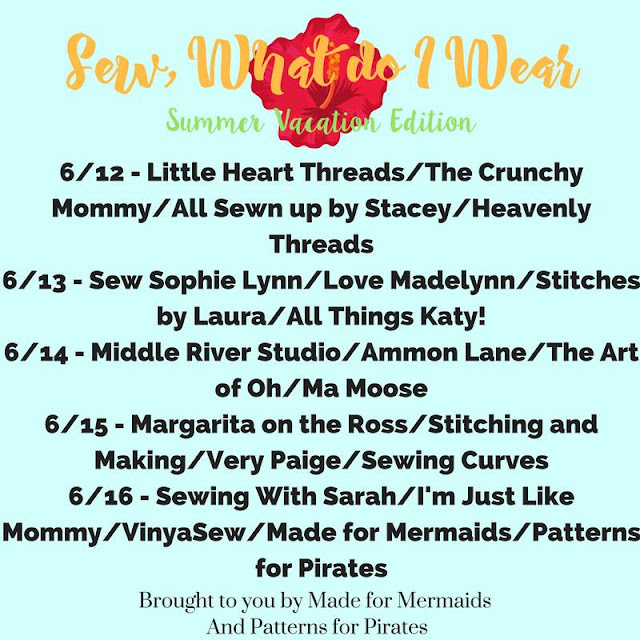 So my original idea for my vacation outfit was to do a romper hack of the Made for Mermaids Mama Sommer top with the Pirates Palazzo shorts. It kind of worked great. The idea I think was awesome but execution was lacking. HOWEVER the shorts turned out great, so I'll be cutting those off the romper--they were in that same light blue tie dye as my tank above. This rayon spandex is from the Nicole Miller line at Joann. I got it last year and made a Boundless dress and have been hoarding the last bit. It's not super lightweight which makes it perfect for these shorts. Here's how I made the shorts. Using the Patterns for Pirates Palazzo pants pattern (there's a tongue twister for ya!) I sized up. I measure as a L-XL, and I cut out the largest size available, 4XL. I also raised the front and back rise 2 inches. (This was my mistake for the romper--it should have been more like 4 or 5 inches to meet the bodice). I also dropped the crotch a little bit, but I don't think that's super necessary. And then I just flared the leg out a little bit to make them more swingy. I gathered the waist with clear elastic and added a waistband. Done! I think these shorts will be perfect for wearing to the beach over my swimsuit. And with that super lightweight tie dye rayon spandex, they'll make super PJ shorties. I've been wanting knit culottes for a long time. Perfect for summer!